NOSE: a delicious bowl of rum soaked raisins, floral honeysuckle, vanilla, sweet citrus candy like what your grandma would have in a bowl on the coffee table. Water opens up flavors of red kool-aid, ripe red plums and sweeter vanilla extract. PALATE: Smooth, oh so smooth. A slight oak fills the mouth and then a room full of leather. Spices and light smoke with a finish of sherry. Round and very enjoyable. As it rolls down it coats the tongue. Delicious. FINISH: The finish is medium long with a lingering light smoke at the end. The spice runs off quickly and your mouth is left with melon fruits and honey Oh THE HONEy. I know what you’re thinking…A BLEND?!?!?! Yes, a delicious and amazingly round and full blend. If you’ve ever had some preconceived notion of blends not standing up to single malts, please, check your notions at the door and give this one a go. The Japanese pride themselves in striving to be the best at whatever it is they do. And when it comes to this scotch, they do not fail. 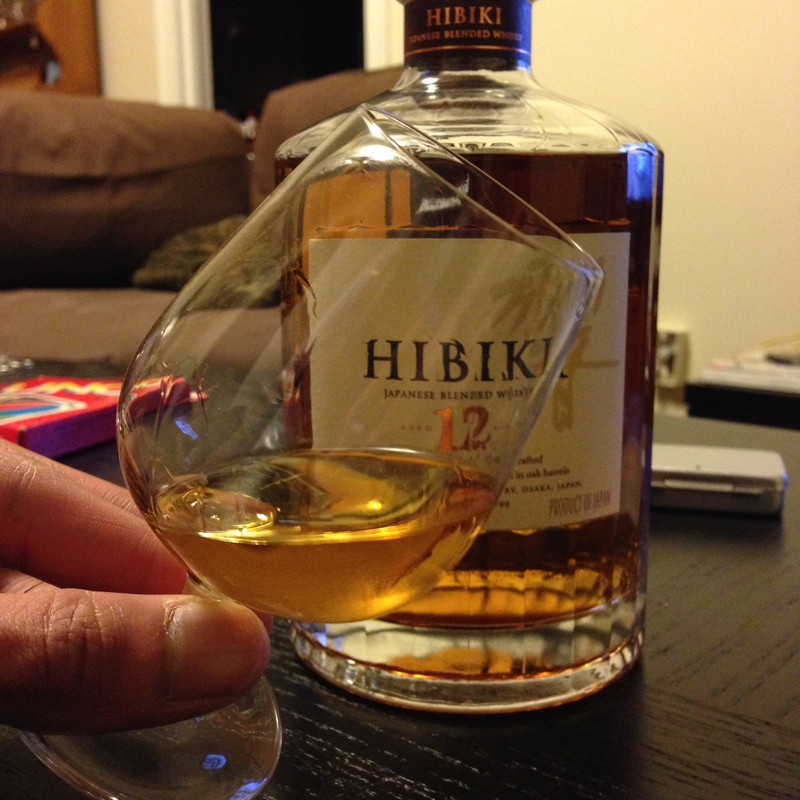 If you have Hibiki in your area, I urge you to pick a bottle up. If your liquor store doesn’t carry it, ask them to. Plus it comes in a gorgeous 24 sided bottle with a glass topper, which gussies up any liquor stash. You’ll need to be able to restock your liquor cabinet once it’s all gone. I have heard that they’ll be bringing the 17 to the US market later on this year. Previous Post What’s in a nose?